ტეხასის ანექსია — ტეხასის რესპუბლიკის ანექსია აშშ-ის მიერ 1845 წელს. აშშ-მა ტეხასის რესპუბლიკა თავის 28-ე შტატად გამოაცხადა. ამან ამერიკა-მექსიკის ომი გამოიწვია, რის შედეგადაც აშშ-მა დაიპყრო მრავალი ტერიტორია და გააფართოვა თავისი საზღვრები. ტეხასის ტერიტორია გაიზარდა და მოიცვა ის მიწები, რომლებიც ამჟამად შედის კოლორადოს, კანზასის, ნიუ-მექსიკოს, ტეხასის, უაიომინგის, იუტასა და ოკლაჰომას შტატების შემადგენლობაში. Avalon Project at Yale Law School. Texas from Independence to Annexation. 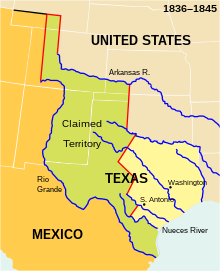 Joint Resolution for Annexing Texas to the United States, Approved March 1, 1845. Jones, Anson. Letters, Relating to the History of Annexation. Galveston: Civilian Office, 1848. Ordinance of Annexation, Approved by the Texas Convention on July 4, 1845.